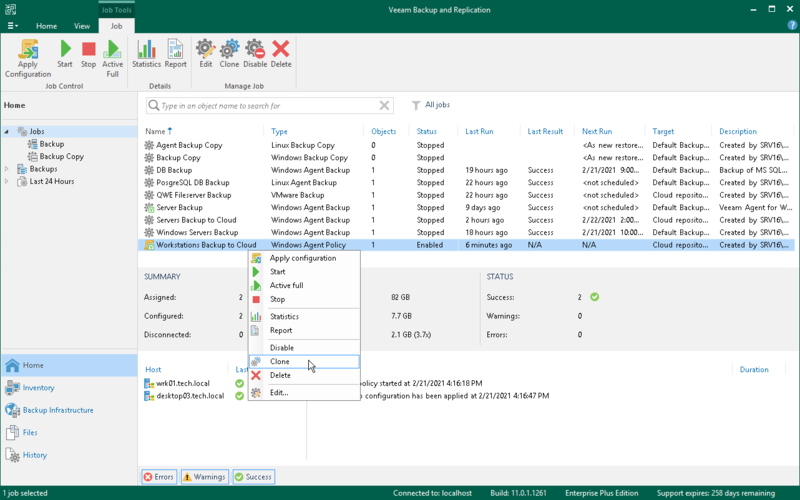 You can clone backup policies configured in Veeam Backup & Replication. For example, you may want to configure a backup policy that will be used as a ‘policy template’, and use this policy to create multiple policies with similar settings. In the working area, select the backup policy and click Clone on the ribbon or right-click the backup policy and select Clone. After a backup policy is cloned, you can edit all its settings, including the job name. The backup policy cloning functionality is available only in the Enterprise and Enterprise Plus editions of Veeam Backup & Replication.